Without even knowing the fall trends that Darlene would pick out, my roundup of fall Target dresses hits on several: plaid, western and ‘80s style. I used to buy a ton of clothes at Target and thought it would be fun to do a roundup of bust friendly dresses currently available there. The majority of the dresses are shirt dresses with a belted waist, but additionally there is a dress with smocking at the waist and a wrap dress. 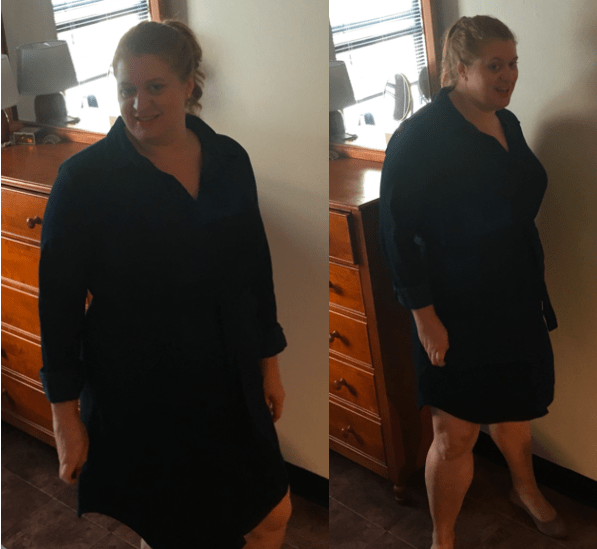 I didn’t keep any of these dresses (but ended up re-ordering one after writing this post!). 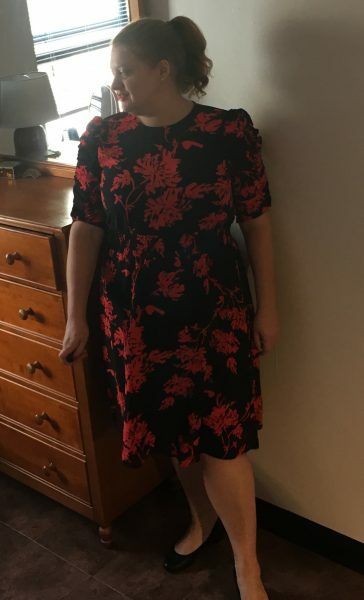 Hopefully some of you will be inspired to go out and buy an affordable bust friendly dress from Target this fall. The smocked waist dress comes in two different floral prints and black. This dress was fun to try on and the puffed sleeves are definitely on trend with the ‘80s. I have broad shoulders and the puff sleeves felt a bit much to me although it looks lovely. There were some loose threads around the waist smocking so not sure how long this dress will actually last. This floral shirt dress also comes in black, green and burgundy. I almost kept this dress and thought about ordering it in other colors! I had a shirt dress from Target made from the same crepe fabric that I wore for three years until the fabric on the sleeves was shiny. This is a great dress for work. The dress does have a waistline that the belt ties over so if you have a large difference between your bust and waist this might not be a great option for you. Plaid is a trend for fall – but not with this dress. 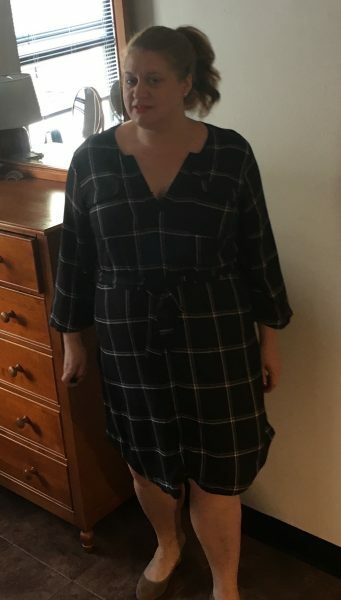 You can tell by the look on my face that I am not into this plaid shirt dress. The fact that it came ripped and with makeup smeared on it didn’t really make me like it better. What can I say? The brownish/tan plaid is ugly, the dress has no shape and the fabric felt cheap. My apologies if any of you love this dress or own it! This one definitely got returned. 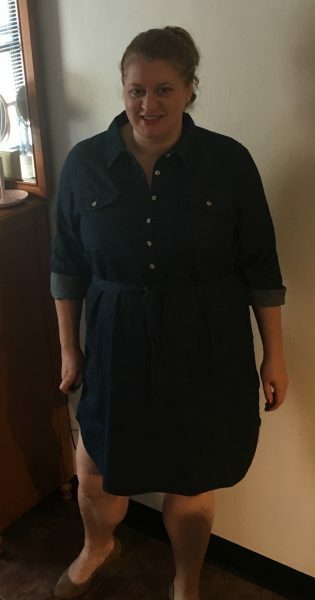 The next dress is one of two denim shirt dresses that I tried on. This one fit well and would be a great addition to a fall wardrobe. It doesn’t have a set waist so the belt can be tied anywhere. The dress is cut straight up and down so ladies who are curvy on bottom might have trouble with this one. 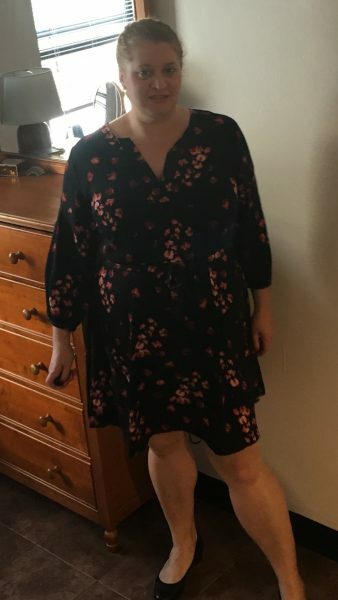 I returned this wrap dress and then after studying the pictures decided to re-order it. My initial reasons for returning were that I think it is a little low cut for work. But maybe if I sew a hook and eye on the neckline or a snap it will be more work friendly. Definitely planning to wear this dress this fall even if just on the weekends. It has dolman sleeves which do add extra room at the bust. The last dress I tried on was another denim shirt dress. This one gaped a bit at the bust but not horribly. In the past I have sewn button down dresses closed to make them fit when they gaped. All of the dresses I am wearing are size XXL. My measurements the day I took these photos were 48.5-41-46.5 and I’m 5’7. Do any of you have shopping success at Target? Cheap crepe can just feel so cheap, and I think because it can shift so much, it really needs more tailoring than most companies are really going to put in. I had a shabby apple dress I wanted to love and it was just – eh – at best. For the wrap dress, I found making a small bar tack between the facing of the front wrap and the seam of the back has worked well without interfering with the movement. I always worried that a snap would be too heavy and cause it to sit funny, but a hook and eye may be better. Small bar tack is a great idea! I’ll try that. 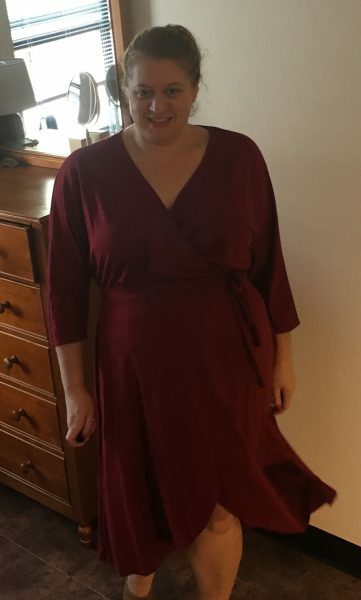 The burgundy wrap dress arrived in the mail for the second time and I decided to return it again for the second time. I still think it is a beautiful dress but I also realized that it is a dress I would constantly be adjusting and pulling at. One of the reasons I wear dresses is so I’m not constantly pulling my shirts down or pulling my pants up.